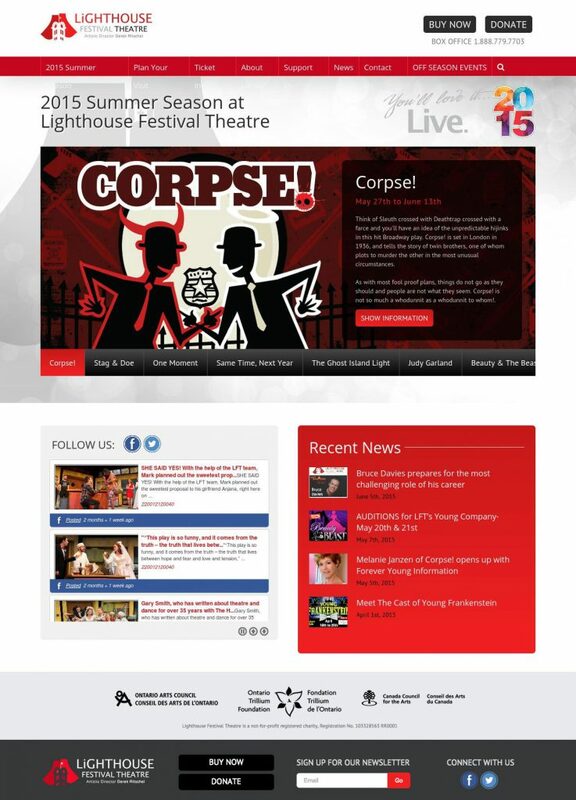 Stature Marketing worked closely with Lighthouse Festival Theatre to craft a website focused on user experience with a clean and modern design that showcased all the the theatre has to offer. Lighthouse came to us with an idea of their top level needs but unsure of what technology was best to develop the website. We coached them through a needs assessment, and strategizing the website design and development plan. The website features included: event management with multiple categories and condition, newsletter, blog, a large number of unique pages, sponsor management, actor management, and social media feed integration. Most importantly, the client would be using and updated the website very frequently and needed a simple administration system. The theatre and it’s patrons love the new website and the results speak for themselves! We chose to develop the website with Wordpress content management system. Working with a modest budget allowed us to spend some time with design, but mainly focus on developing the required features. The end result was a powerful website packed with features and a simple site administration. The instructions and training provided allowed the client to maintain nearly every aspect of the website.